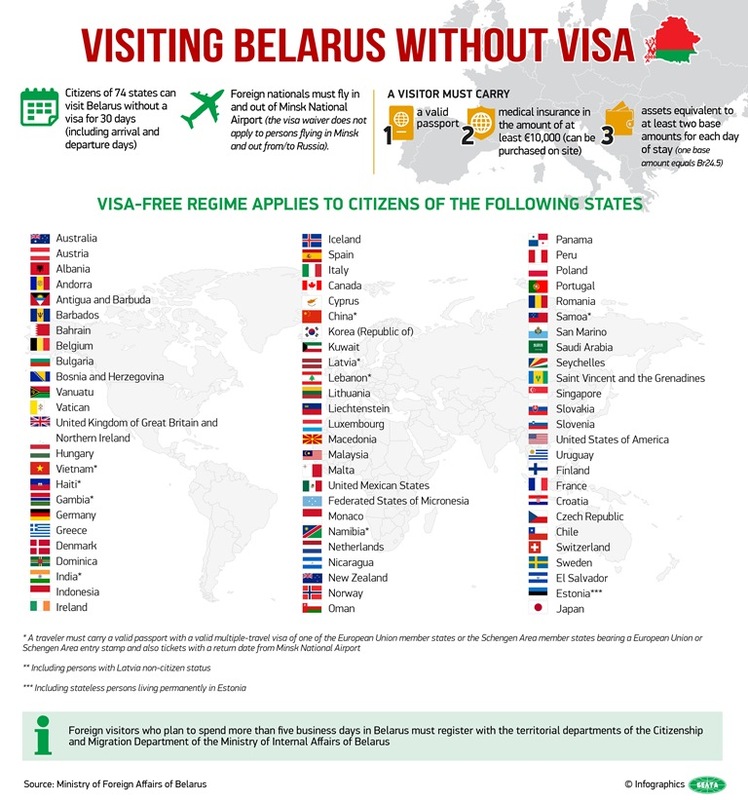 Since July 2018 it is possible to visit Belarus without a visa (visa-free) for a period of 30 days, enough time to visit the capital and the main tourist attractions of the country. In this post I will explain which requirements you must meet and what documents you need to travel to Belarus without a visa and with visa. At the end of July 2018, it was approved a Presidential Decree in Belarus allowing citizens of 74 countries to visit Belarus without a visa for a period of up to 30 days. Among these 74 countries there are India, European countries, as well as Australia, Argentina, Brazil, Indonesia, Japan, United Kingdom or the United States, among others. The 30-day period starts counting from the moment you stamp your passport when you cross the border. If you leave the country later than 30 days, you can receive a fine of up to 550 euros, unless it is due to illness, natural disaster or other unfortunate circumstances. You must be a citizen of one of these 74 countries. The list can be found at this link. You must enter and leave Belarus by plane through the border control post of the Minsk National Airport. This means that to be able to enter Belarus without a visa you can’t do it by bus, car or train (or to leave either). 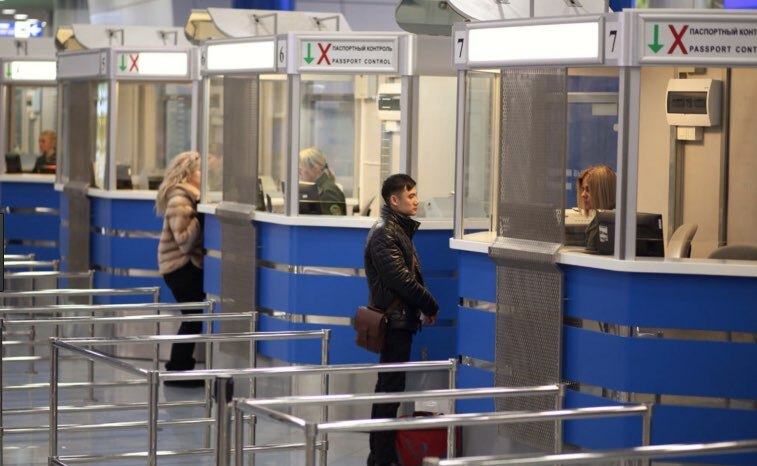 In addition, you must bear in mind that this free visa regime does not apply to people arriving by plane from Russia or to people who intend to travel by plane from Belarus to Russia, even if they have a Russian visa. This is because flights between Minsk and Russia are considered internal flights. Therefore, if you are planning to visit Russia as well, you will have to take an international flight to leave Belarus, for example, to Poland or Lithuania (or another country) and from there take a flight to Russia. Financial means: have at least 25 euros (or its equivalent in dollars or rubles of Belarus) for each day of stay. That is, if you are going to spend 5 days, you will need 125 euros. You can buy it at the airport itself, in a window that says “Obligatory medical insurance”. The policies sold are either from Belgosstrakh and Eximgarant. They are quite economic. These companies don’t sell insurance online on their website. You can bring your own printed international insurance, which must have coverage in Belarus or specify that it has worldwide coverage. It is convenient that the insurance is in Russian or English. 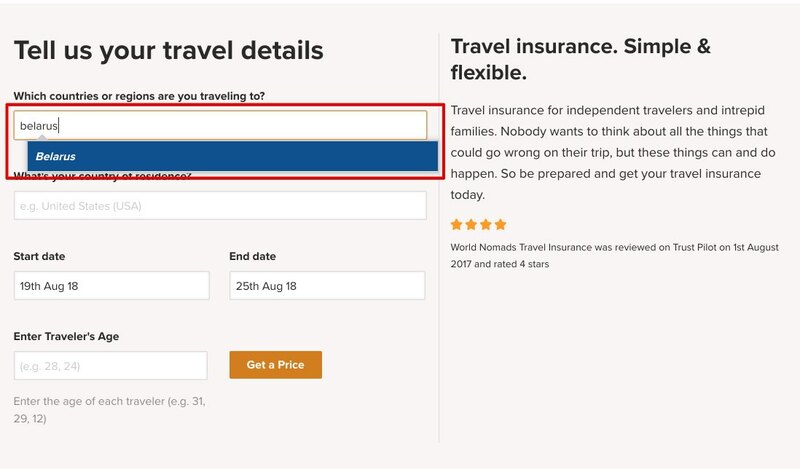 For example, World Nomads travel insurance (You can get this insurance in 5 minutes online). In summary, the documents that you need to bring are very easy to obtain. Note: If you are a citizen of China, Haiti, Honduras, Gambia, India, Lebanon, Namibia, Samoa or Vietnam, you must have a valid document for travel abroad, with a valid multiple visa of the member states of the European Union or a participating Schengen State, with a note of entry into the territory of a member of the European Union or a member Schengen State and notes confirming the departure of the Minsk National Airport within 30 days from the date of entry to Belarus. It is mandatory to register only if the stay is longer than 5 days and must be done during these first 5 days. If you stay in regulated accommodation such as hotels or hostels, the administration of these accommodations will be responsible for making the registration.. 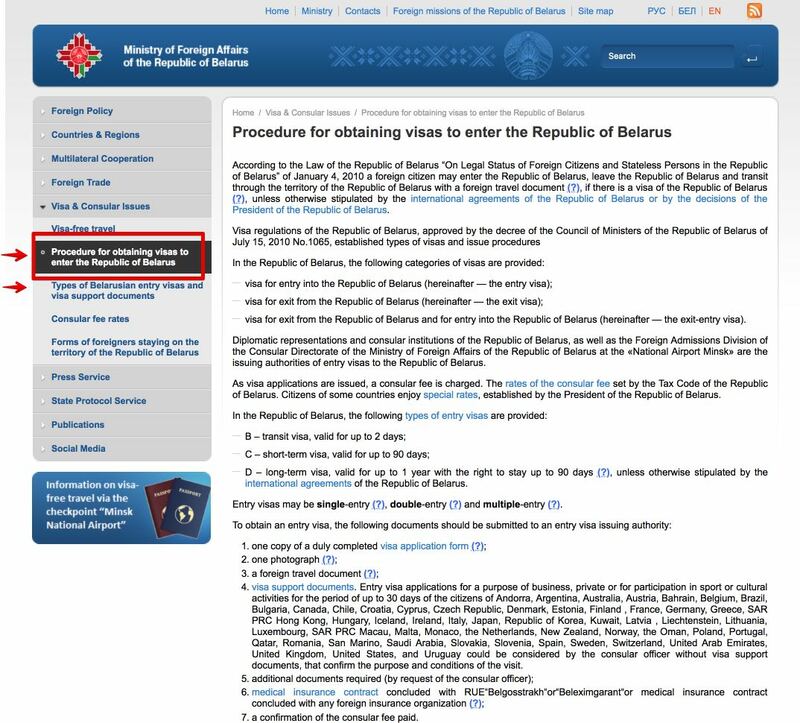 If you do not meet the requirements to process the Belarus visa-free, either because your stay is longer than 30 days, either because you enter another place different to the Minsk international airport or because later you will travel directly to Russia (or come from Russia), then you must apply for the visa to Belarus. Transit (Type B), to cross the Belarusian territory to another country (for example to Russia) and that is valid for 2 days from the date of entry. Short term (Type C), valid up to 90 days. It can be for tourism, business, studies or private affairs. Long term (Type D), valid for up to 1 year with the right to stay up to 90 days. It can be for work, business, sporting events, journalistic activity, private affairs, etc. Fill out the visa application form, you have to sign and paste a photo of 35 x 45 mm. Visa support documents that justify the trip. It depends on the type of visa and the reason for the trip: letter of invitation from tourist agency or educational institution, hotel reservations, visa of the country of destination (in the case of transit visa), etc. In this link are detailed the necessary documents according to the type of visa. Have you visited Belarus without a visa? What has been your experience?